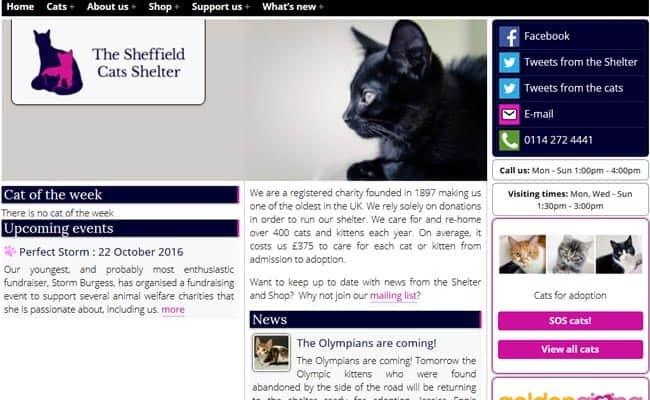 Sheffield Cat Shelter, Sheffield – Sheffield Cat Shelter is a registered charity founded in 1897, and one of the oldest in the UK. We care for, and re-home, over 400 cats and kittens each year. Every cat receives a full veterinary health check and any medical treatment it requires, regardless of cost. We never put cats to sleep unless recommended by the Vet for the cat’s welfare or when there is no treatment that can help.